Raylan and Boyd face off in Justified’s final season, reviewed. 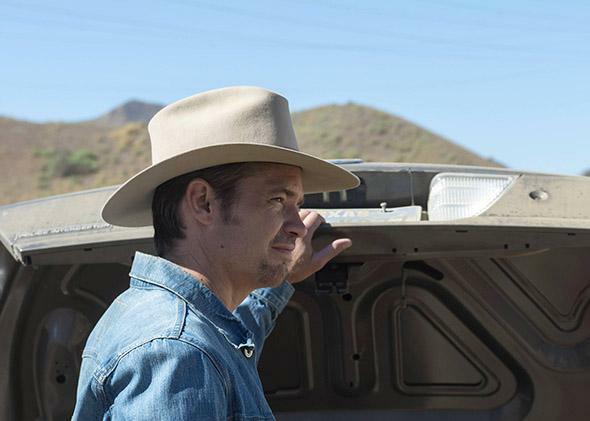 Will Raylan Givens face the consequences of his itchy trigger finger in Justified’s final season? Timothy Olyphant as Raylan Givens in Justified. Imagine that you could read the employee file of United States Marshal Raylan Givens. Over the course of his career in law enforcement, Givens, the tall drink of water played by Timothy Olyphant in FX’s Justified, has assembled quite a bit of paperwork. Flip open his overstuffed folder, and you will see scores of cases that ended in death—usually thanks to Givens’ quick trigger. Mixed in with these reports are complaints from individuals claiming Givens used excessive force, violated their rights, or otherwise bent the law. The file is also full of professional reprimands, wrist-slaps, and suspensions. To be fair, it also contains a number of commendations, clippings of tough cases Givens closed, and reports from internal investigations clearing Givens of wrongdoing. But if you’re paging through the file without laying eyes on Raylan Givens himself—his handsome mug, his knack for wearing a tie with jeans, his banter—the paperwork would paint a unfortunate picture of a lawman who behaves, when it suits him, like an outlaw. Justified, entering its long overdue final season Tuesday night, has always had a soft spot for the outlaw. Each of its six seasons have been chock-a-block with supporting characters hell-bent on getting over and making the big score—and stealing scenery in the process. The criminals on Justified make for a vivid crew of mob bosses, moonshine makers, Detroit drug runners, loquacious former skinheads, Florida rednecks, and idiots with big plans. Raylan, raised in Harlan County, Kentucky, by a violent and cold father, has always had more in common with this ragtag crew of high-charisma crooks than with his co-workers, a static group of relative professionals who tend to abide by the law as they play eye-rolling straight man to Raylan and the various no-goodniks tromping around the Kentucky hollers. Justified’s affection for criminal­s, for their irrepressible joie de vivre, has both distinguished the show and, over time, undermined it. The series’ great second season featured Margo Martindale’s ruthless moonshiner Mags Bennett as Raylan’s season-long antagonist, and established the sort of heft and pathos Justified could bring to its bad guys. But in the seasons since, Justified has pulled back from that kind of grand, gut-wrenching storytelling to mix delectable procedural episodes with increasingly over-the-top, blood-spattered, and unsatisfying season-long narratives. Justified’s love of the wacky short-story character—the show is based on an Elmore Leonard tale after all—has made it funnier and less self-serious than other superficially similar antihero shows, but it has also made it dunderheaded. Justified has become highly susceptible to being charmed by hideous and grotesque behavior—from criminals, but also from Raylan—so long as it makes for a good yarn. This season, Justified finally gets to telling the yarn it has been pushing off for years and years, the final confrontation between Raylan and Boyd Crowder (Walton Goggins), the verbose, intense, brilliant criminal who was once Raylan’s childhood friend and has since become Raylan’s alter ego. (There but for a badge goes Raylan.) As the season begins, Boyd and his extended crew are robbing banks in the hopes of fleecing one particularly rich target. But even as Boyd is trying to make one big score, the Marshals have focused their resources on nailing him for once and all. Raylan is even running Ava (Joelle Carter), Boyd’s fiancée, who spent last season in prison, as a confidential informant. The confrontation between Raylan and Boyd, in the works since the series began, imbues the series with some of the urgency it has lacked in recent seasons while it wasted time in the backwaters of Florida and in Detroit high-rises. And yet as rejuvenated as Justified feels, it can still be uncomfortably enamored with Raylan’s bad behavior. As the new season begins, Raylan is once again on a short leash at work. But because of his experience with Boyd and Ava he’s working this one last case before moving to Florida to be with his daughter and ex-wife. And yet despite being in real trouble with his co-workers, in the early moments of the first episode, Raylan opts to deal with an unhelpful Mexican police officer by T-boning said officer’s car, kidnapping him, and driving him over the border to answer questions. Raylan is still unhinged, and yet Justified keeps making him look pretty damn cool. This is a particularly freighted moment for any TV show to glamorize police-overstepping. Because Justified’s criminals largely come from Appalachia and are the white poor, Raylan’s actions don’t have a racial charge. But there Raylan is, slamming the face of a known criminal imbecile, who has a restraining order out against Raylan and who was recently released from prison because Raylan violated his civil rights, into a steering wheel, for almost no reason. Raylan’s casual arrogance about his ability to do, and get away with, violence is at such a level I am hopeful Justified is finally going to pull the rug out from under him. For seasons it has felt like Justified was stalling on adjudicating Raylan’s immense character failings because it would alter the chemistry of a TV show in mid-run. But the series’ time is running out now, and maybe so is Raylan’s free pass. In a new episode, Raylan visits his old boss Art (Nick Searcy), looking for reminders about “why to be patient” with Boyd, instead of just shooting him dead. Art answers that Raylan might go to jail, he might lose his job—or maybe, the bullet would find Raylan instead. Raylan greets this last possibility with total skepticism: No gunslinger will ever best Raylan Givens. “Sometimes it just doesn’t go your way,” Art tells Raylan. Raylan’s scoff is that of a man who doesn’t know that maybe, just maybe, his fortune is being told.